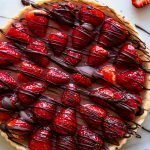 Fresh strawberries with hints of orange and vanilla fill a flakey tart crust and everything is covered in a chocolate drizzle. If you’re baking your own tart crust, follow my recipe for pastry/pie dough. Take 1/2 of the dough and press it into your part pan and use a rolling pin to cut off the excess edges but rolling it on top of the tart pan. Pierce holes to the bottom of the tart crust, line it with parchment and weigh it down with pie weights, beans or rice. This helps make sure the tart crust won’t smush up in the oven. Bake in the preheated oven for 17 minutes, remove the parchment and weights and bake for another 10 until golden brown. Let the tart shell cool. Halve and hull the strawberries. Arrange them in the bottom of the tart shell. Combine the sugar, arrowroot powder, water, orange juice, and vanilla in a medium saucepan over medium heat. Cook until the mixture comes to a slow boil and remove from the heat. Pour the liquid mixture over the strawberries, making sure each of them is covered. Place the tart into the fridge and chill for 3-4 hours so the tart can set.